Today’s the day that T-Mobile’s new TV effort goes live. TVision Home launches today in Chicago, Dallas-Fort Worth, Los Angeles, New York City, Philadelphia, San Francisco, Washington D.C., and Longmont, CO. More markets will get TVision Home later this year. Pricing is set at $90 per month including a $9.99 per month discount for T-Mobile customers that’s available to everyone for a limited time. Adding TVs will cost $10 each per month. TVision Home uses your existing wired broadband connection. If you’re a a Dish or DirecTV customer, T-Mobile has a deal to tempt you to switch to TVision Home. With Satellite Freedom, T-Mo will pay your contract termination fees up to $500 via a prepaid card when you switch from Dish or DirecTV to TVision Home. In exchange for their $90 each month, TVision Home customers get more than 150 channels, local broadcasts, regional sports, and DVR. Premium TV packages like HBO and Showtime are available for an extra charge. 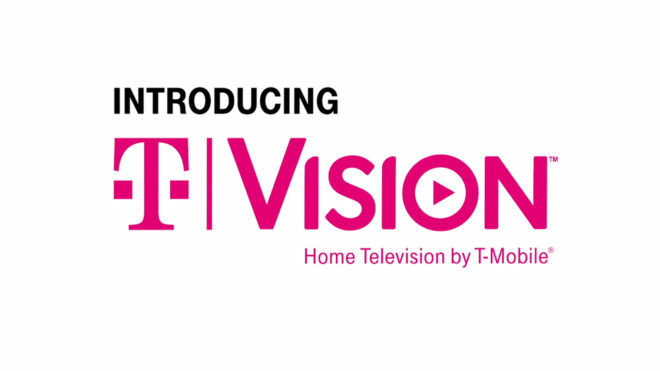 T-Mobile touts that in total, TVision Home has more than 275 channels available along with more than 35,000 on-demand movies and shows. If that’s not enough content, support for apps like Pandora, iHeartRadio, CuriosityStream, Toon Googles, and HSN is available, and Netflix, YouTube, and Amazon Video are coming soon. Other features of TVision Home include DVR with 1TB of storage that’s good for more than 400 hours of DVR content and an AI that’ll learn what you watch as well as when and where you watch it to serve up shows that you’ll like based on the hour and your location. TVision Home is integrated with Facebook and Twitter, too, and you can use Amazon Alexa and Google Assistant to control TVision Home with your voice. T-Mobile plans to launch TVision Home apps for Android and iOS in the future so that you can watch TV on your phone anywhere in your house. Also planned for the future is bringing TVision to “popular third-party TV platforms” so that you can download an app and begin watching without the need for an extra box or other piece of equipment. 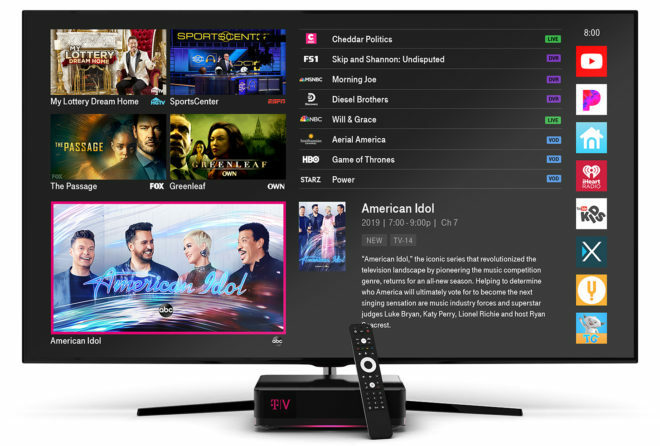 We’ve seen streaming services like Sling TV, Playstation Vue, and YouTube TV become popular lately, and so TVision Home is facing some competition right out of the gate. T-Mobile’s service is also only available in eight markets at launch, so hopefully we see it expand to more markets soon so that other consumers have the chance to try TVision Home if they’d like to. Now that TVision Home has been official for a few days, what are your thoughts on T-Mobile’s TV service? What would you like to see change in the future? Zero interest with that pricing. Extremely disappointed. Was expecting more out of T-Mobile. Don’t see the #Uncarrier in this offering. I give this a year before it fails miserably and is discontinued, unless there is a serious price reduction! Crazy! No significant bundling discount either? What are they thinking? John Legere, this is not a very good deal, at least in my opinion I may be wrong but I do not think I am. This bundle is only good for people who are all of the following: REALLY REALLY love TV, people who don’t want to deal with the local cable or satellite provider, current T-Mo customers. If you don’t meet all of the above criteria there is absolutely no value in what they are providing. Considering the pool of people that meet all of that criteria is extremely small, this is going to completely flop. This level of streaming TV was already available. It’s called PSVue. I am in Chicago and have zero interest in this. It’s more expensive than any other streaming service in the area and by a huge margin. This is a complete and utter fail. Honestly they would be better off just offering channels for 50 cents to 1 dollar per month a la carte. It would be unique in that it would give a choice to people who only care about a handful of channels. Seriously wtf was Tmo thinking?Have they not looked at DirectTvNow, Sling, Vue, Philo etc? Nobody gives a damn if they offer 150 channels.Most people don’t even use all the ones they have now.Even without a discount you can get over 105 channels for 65 bucks with DTVN. Back to the drawing board on this one if you ask me.There is nothing disruptive at all about it. Ditto for this Philly market TMobiler. Can get a better deal with any of the other options, including Comcast or FIOS. That is stunningly bad…for TMO. Major fail, but perhaps it’s just a bone to the FCC to get passed the merger. If not, this will be a quick intro/death for a lousy offering. I am betting not one sole cared….. it’s not a deal, you can get much better deal, just telling your current provider you are going to end service. Heck you don’t have to do that. I pay less now for TV. I give this to end of the year before its scrapped. Why would a fish care? Might as well just keep your current provider if you have one. It’s not an uncarrier deal for sure – I think the only rationale for this is to demonstrate to the FCC that Tmobile is in the market to challenge and create competition for TV and that if able to merge with Sprint, the increased capacity, 5g streaming model, etc. would be best for all. Literally, this is the only reason I can come up with for this weak roll out. No TV commercials, no letters home to Tmobile customers advertising, etc. Definitely seems they’re doing it just to demonstrate their intent. unbelieveable, way out of line ……and it requires you to get your broadband from another provider..? it doesn’t interest me at all….. even if they offer 875 channels, most of them are a bunch of crap anyway. Pricing like that might be reasonable if it included unlimited internet service. Cannot believe that anyone will pay that much for just another streaming service provider. Even if unlimited 5g was included for watching you’re going to be cheaper with satellite or cable in most cases. There’s nothing about this that’s appealing that I can see. They need to bundle this service with unlimited 5G (for both streaming video and for general internet access) and keep the total price under $100. Still be tough to beat the others. Every April my directv bill credits end. Every April I call and they reduce it. I’ve been doing this since 2006 and there must be stiffer competition because this year 4 TVs were going to go to $169 next month. I called and said lower my bill and he went to $80 right off the bat no questions asked. Ymmv of course but once out of contract you own them. This is nothing more than a rebranding of the service they bought. Chances are they cannot get better carriage terms with the media companies because they have very few customers. My guess is they will change things up when/if the merger goes through and they get their 5G network (both mobile and inHome) up and running to get a larger pool of potential customers. Then they will go back to the media companies and renegotiate better terms. I don’t believe this is their “end product” for this service. It’s just a rebrand and for visibility in the marketplace. Feel sorry for the poor fools who bite on this…. maybe not. If you’re dumb enough to fall for something the cable and satellite TV companies were pushing almost a decade ago, then I guess you deserve it. Had this when it was Layer3 for almost a year. Got rid of it late last month because it was very unreliable. The set-top boxes were occasionally unresponsive to the remote controls, would crash or freeze often, and needed to be rebooted at least once a week. The DVR would randomly throw itself in a loop repeating the same 3-second portion of a program endlessly. They also don’t carry all of the same local channels that other providers do. I’m glad to hear first-hand experience from someone who doesn’t have a sales quota or will make a commission to sell it. And you are hearing about a previous company’s product that no longer exists. He stated he got rid of it last month so T-Mobile DID own it then and should 100% get blamed for his issues. Old product and old software are gone. New product and new software are here. The review of the old equipment doesn’t help me decide on a new product from a new company. Totally irrelevant. Not necessarily. It shows he had on going issues and T-Mobile didn’t get them fixed but gladly took his payment. History always has a way of repeating it self and who’s to say it will or won’t again? It’s never a good idea to buy a new service, new model car etc. as you’re guaranteeing yourself issues and basically paying them to be a beta tester. I’ve seen it hundreds of times and this will be no different. They should have done something like directv and give a substantial discount to the early subscribers for a year or better. There’s truly no incentive to join. I concur. The only change so far is the name. More proof slybacon spoke to soon then. Was Lvl3 at least cheaper? About the same as the others. Still not worth it for what I got. Very unreliable. It would be optimistic I think to expect all the kinks are gone that easily. Especially a relaunch of the service. It is T-mobile’s first try in TV afterall. It is reasonable (and not unexpected) that there will be some initial kinks. Still, the real question is both the service and the risk worth $90/mo? For that price and having no track record, not sure they will get that many beta testers. in one month, TMo isn’t going to do an entirely different hardware rebuild, nor software from scratch. One month?? Tmo purchased Layer3 almost 15 months ago. You don’t believe they only maintained Layer3 software and hardware for 14 months and then just converted to T-Mobile’s new format in one month, do you? They’ve been working on their own software and hardware since the acquisition. He is using older equipment though. To me, this is not at all interesting. Even if you were a cable user with a premium package, which this is supposed to be aimed at, I don’t see how this would draw you away from your current package with big cable. This just seems embarrassing to me. How so? It takes 5 minutes to sign up and an appointment schedule within a few days. Has been working great for me! Never had a rectal exam but still sounds easier to set this up. TVision DOA( Dead On Arrival). Exactly. The coming soon stuff ends it. Who is looking to add a new box? No one. Abd once most people look at this, go meh, they arent going to come back later to look again. Not all but most. I remember when I had a car payment that was $90. Current TM customer and would really like to cut the cord completely. Unfortunately this offering is useless until TM offers 5G with no data caps for HSI. Even with that, sadly, cable offering would likely be less. wow, I feel disappointed for some reason I cant seem to understand. Rumor mill says this pricing is a scam. TMO is trying to pressure the Trump administration into approving the merger with Sprint so they can sell a 5G bundle at a competitive price. I expected way better than this from T-Mobile. Instead, it is a high price for a bunch of stuff I already have (and/or can get elsewhere) for less money. Plus, I’m not connecting another box to my tv!